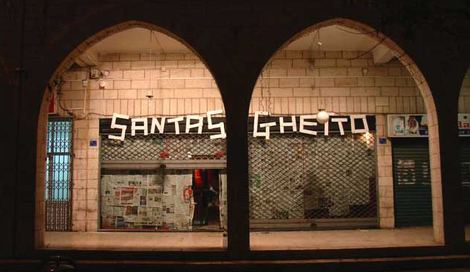 "This year we've moved out of Oxford Street into a former chicken shop on Manger Square in Bethlehem opposite the Church of the Nativity (where Santa Claus was actually born)." The show kicks off tonight, and you can check out all the work on show on this slideshow, or check back on this blog page about the exhibition. 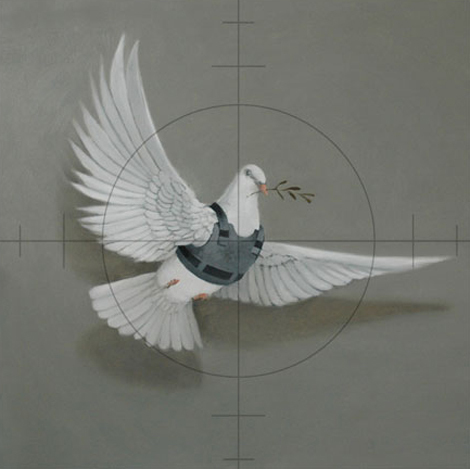 Banksy's Dove painting (above) is apparently still at customs in Tel Aviv, but they're hoping to set it free in time for the show. They'll be opening an online shop shortly, in case you can't make the trip out there (though there are travel tips on the site), and they've also been doing a bit of local decorating on the West Bank Wall and surrounding area.